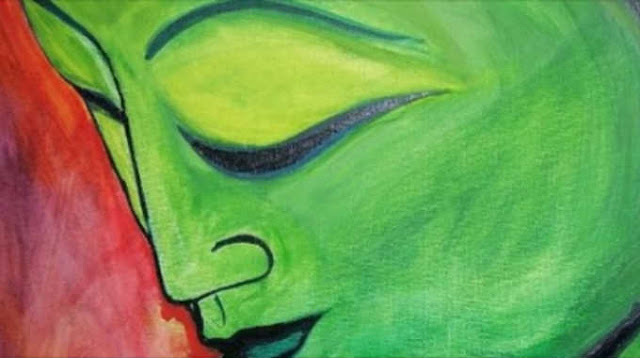 Instead of Searching for Love, allow it to Arrive—Buddhist Style. Home » Relationship » Instead of Searching for Love, allow it to Arrive—Buddhist Style. What if we stopped searching for love? Eventually, all the searching we do for love tires us out. I know it did for me. Reaching outside of myself to look for it is a struggle that leaves me slightly crazed, insecure, and hollow. When we want the outer world to appease our inner fears, it rarely (if ever) does. Instead, when we do this, we are left feeling broken (the opposite of what we desired). You know that really sweet idea we have about love—the one we are told about in songs, movies, and society in general? Well, it’s not true. When we pursue the belief that another person or experience will offer us the opportunity to (finally) feel complete, we are headed for trouble. This is what we do so often in life—we expect something else to make us feel whole. I have done this so many times. When we believe that our worth comes from the outside, we will always feel like we need more love. This is not news, but just honest information—as much as we want to believe it’s not true, no one will ever be enough to fulfill us, if we cannot fulfill ourselves. The ironic thing is that when we chase after something, it usually just makes that thing run away faster. There is not much that we can actually control. Why would we try to do this with something so wild as love? In Buddhism, we understand that everything is constantly changing. This change, we are taught, is out of our hands. In this teaching lies the foundation for an acceptance of something really big—the principle of impermanence. If we can accept impermanence, then we are not so surprised when our external world is what it is—undependable. Rather, we realize this is so, and we find something underneath that is more real and solid. Buddhists believe that the one thing we can learn to depend on is our own self. We learn that instead of chasing experiences or people to fulfill our needs, we attend to them first. This is done by becoming tender in this moment. Instead of thinking that another thing might complete us, we choose to do the compassionate work of finding our own completeness—presently. We turn our gaze toward ourselves, and we look inward. The way out of suffering is within ourselves. Our freedom is found by returning to our own hearts, not in turning to another’s. Isn’t that what we all want—to feel good about who we are presently? Chasing love then becomes so “last year,” because we realize we already have it. This reverses our sense of being broken—we stop believing that we are lacking anything. Imagine if we’d been doing this our entire lives? How full would we feel? Instead of being conditioned to dislike who we are, we’d see ourselves without judgment. Accepting ourselves is the way we can allow love to arrive. It won’t happen immediately. Loving ourselves takes time to learn how to do. The practice we use in Buddhism is meditation. We get still, and we observe what is here. As we practice being with what is in us, we begin to feel okay with who we are. We start to see ourselves as loved, because that is the act that we are doing—loving ourselves. For me, self-love came after I’d exhausted all other resources of trying to get it somewhere else. And trust me, I tried. But here’s the thing, when we begin the tender journey of loving ourselves, then others become more drawn to us. When we already feel complete, it takes the pressure off of everyone. Then, others naturally want to be near us. The really funny thing is that we won’t care so much. We no longer need them to feel validated. So please, take the risk—give up of this endless search for love. Let’s find love in our own hearts. Let’s hold ourselves and adore ourselves. Let’s observe ourselves without judgement. We are not broken; we are whole. We don’t need anything to be different. Things are fine just as they are. Now, we can truly begin to know love—for the love from our very own heart has finally arrived.